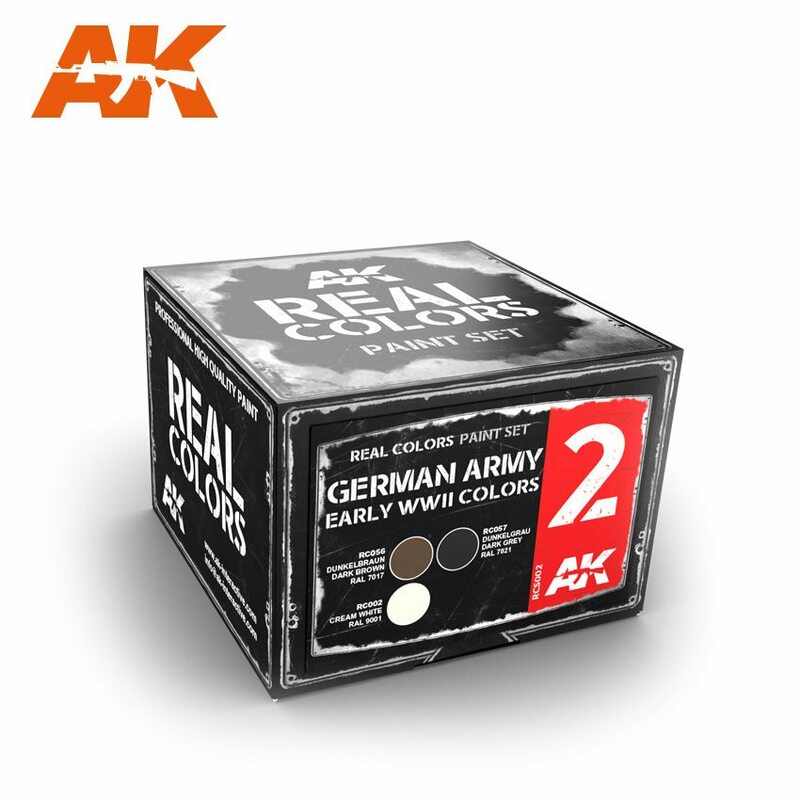 This set contains the three colors that are essential for painting models of vehicles used by the German Army in the early WWII period. Included are the famous RAL 7021 Dunkelgrau (Dark Grey) used as the main camouflage color until early 1943, the RAL 7017 Dunkelbraun (Dark Brown) color which was officially used in combination with RAL 7021 in 1937-1940 period, and RAL 9001 White color, employed for applying the winter camouflage scheme until 1943. Our Real Colors are the highest quality acrylic lacquer paints, made from an improved chemical formula over other brands in the market. They spray smoothly through an airbrush; adhere to the surface and dry perfectly with a soft matt finish. These paints hold firmly all kind of weathering products. They may be diluted with AK-Interactive's specific thinner, or thinners from other manufacturers intended for acrylic lacquer paints (non-vinyl), lacquer thinners, alcohol, or water. They may also be easily mixed with other acrylic lacquer paints. Real Colors accurately reproduce the original colors.